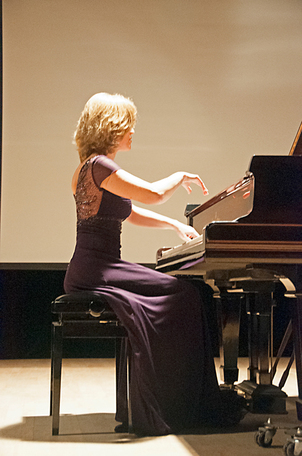 Ths Friday evening, August 10 at 7:00, pianist Olga Vinokur (photo) will present a recital, “Art of Etude,” featuring works by many prominent nineteenth and twentieth century and contemporary composers. On Saturday evening, August 11, at 6:00, Ms. Vinokur will return to play works by Beethoven, Liszt, Scriabin, Rachmaninoff, and Leo Smit/Bernstein. On Sunday afternoon, August 12 at 4:00, cellist Jeffrey Solow will return from last weekend to play the second, and final, of his recitals of the six solo cello suites of J.S. Bach. There are more details (click on each concert on the calendar to get a list of works to be performed) and you may also buy tickets here.